According to Canada Revenue Agency’s mission statement, their objective is to promote compliance with Canada’s tax, trade, and border legislation and regulations. Their main tool is the audit process. The majority of taxpayers file relatively simple tax returns with mostly T4 and T5 income. These tax returns do not represent a large compliance risk since tax is withheld at source on the T4 income and the amounts are easily verifiable. Accordingly, many taxpayers who report this type of income may never be audited by the tax department or have any dealings with a tax auditor. 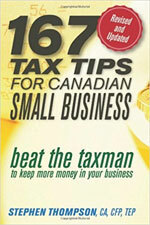 The book from which the article is excerpted is entitled 167 Tax Tips for Canadian Small Business. Here is an updated link to the book.